There are some regions in the world where bugs simply enjoy living. Florida is a good example of a region like this. That’s why people there have tried many different natural homemade insect repellent recipes in the past. For instance, the oil of citronella is the main component in a mason jar of a regular size. Of course, good results are provided by lots of commercially bought repellents, but using essential oils and other natural ingredients instead of using toxins and chemicals is a better choice. Therefore, these luminaries are at the same time effective and visually attractive for bugs of various types. Lemon, cedar wood, thieves and lavender essential oils. 40 drops from each of these oils will be needed. Of course, you should feel free to make a different combination of essential oils and see how it works. However, the effectiveness of this combination has been proven against lots of insects. The amount of oils is for four mason jars. Four mason jars. Feel free to recycle jelly jars. How to Make the Homemade Insect Repellent? Cut the limes and lemons and separate them from the rest of the supplies for a while. Put two sprigs of fresh rosemary in each mason jar. In each of the jars water should be poured. The content should be 75% water. Add essential oils (ten drops) in each jar. You will get the best results with the oils we have mentioned before. The jars should be gently shaken after adding the drops. Put the lime (a slice of it) and the lemon (a slice of it) in the jars. If the jar is not full enough add more water (the jars should be filled almost till the top). 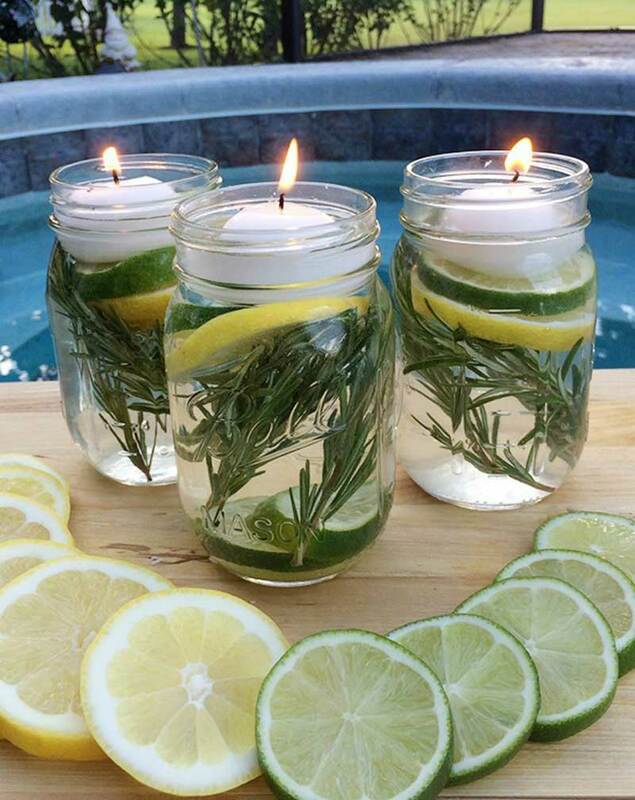 Put a floating tea light candle above the ingredients. Place the jars outside, light them up and witness their beauty and efficiency. Use new tea lights whenever the old ones stop functioning. Remove the content from the jar after three days. Clean the jars and perform the same procedure again.